There is one little trick to buoyancy control that many divers miss: where they place their dive tank! Buoyancy control is by far the most important skill for scuba divers. It makes it possible to maintain your position in the water column, it reduces air consumption, it makes diving less stressful and more enjoyable, and a whole load of other advantages. And there are number of things that can be done to improve your buoyancy. First and foremost, if you’re an entry level scuba diver, take an advanced scuba course, and make buoyancy training a part of your training. 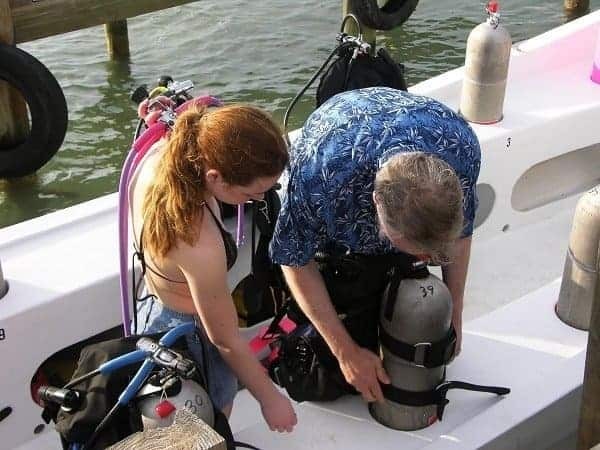 You could also consider taking a buoyancy specialty course, or simply pay for a few dives with an instructor, where he or she helps you practice your buoyancy skills. Simply diving more is also important, as more experience leads to better buoyancy control. Making sure you’re properly weighed is another important element. All of these elements (and arguably more) are part of the entire package of perfect buoyancy control. But there’s one thing I’ve noticed many divers, even experienced ones, neglect to consider: the placement of their dive tanks. Of course, unless you’re a sidemount diver, you’ll probably wear your tank on your back, but how high or low can be key. How high or low on your back (when standing) is a major element of your trim control, that is, how close to horizontal your position is in the water. Place your tank too high on you back, and the weight shifts forward, pushing your torso towards the bottom. This will inadvertently lead you to inflate your BCD more to compensate, which then gives you too much buoyancy, meaning you need more weight to stay down. And presto, you’re overweighed and your buoyancy control is gone. Put it too low, and the problem reverses. Your legs drop, meaning when you fin, you’re doing so in a position that is too close to vertical, meaning every fin kick actually, to some extent, pushes you towards the surface. To counteract this, you either put too little air in your BCD or put on too much weight to compensate. This means that as soon you stop swimming, you start sinking. Then you inflate your BCD more, and when you start swimming again, you head for the surface, making you deflate your BCD again. So you spend the dive deflating and inflating your BCD, losing you air and making for a complicated dive. Unfortunately, there’s no magic formula for where the tank should go. The only way to nail it is by trial and error. If you have your own tank, or you dive regularly with the same dive operator (provided they have only one type of tanks), the process is quite simple. During a dive, take note of your buoyancy and trim. Then, on the next dive, try and adjust it a bit up or down and note the difference. Adjust more up or down over the subsequent few dives and see what happens. Over the course of a few dives, you’ll figure out where you want it placed. Do not change any other factors on these dives. So don’t also change your weight, suit or any other factor, as this would make it difficult to isolate the effect of the tank placement. If you habitually dive with different dive operators, maybe because you do most of your diving on holidays, it gets a bit trickier. Here, the trial and error takes on a further element as you need to figure out the ideal placement for different types of tanks, longer, shorter, aluminum, steel, etc. In this case, taking note of the various factors in a notebook or in your dive log can help you keep track. Over a number of dives with various types of tanks, you’ll start to have an idea of what is the ideal placement for a long, 15-liter tank versus a short one. Or a 12-liter one, or one made of steel, or any other variation. Over time, you’ll be able to make a reasonable guesstimate on how to place a type of tank that you haven’t used before. How do you place your tank? Do you have any personal tank placement preferences? Or any advices for your fellow diver to find the perfect trim by placing the tank in a certain way, share it in a comment below. I was hoping for a one final answer, like 3 inches down from the top. I leaned to place the tank just below the rounding or the top. It’s just not always the perfect place. I use 12 l alu. Thanks for the tips and guidance. The point of the article is actually just the opposite. While rules of thumb (such as “three inches below the shoulder of the tank” or “align the valve the top of the backplate”) are useful as a starting point, and as an end point for many divers, some divers find that they struggle with buoyancy and trim and can’t figure out why. Adjusting the height of their tank placement can be a fix for it, so experimenting with that can be very useful. Ultimately, its about finding out what works for you. Let me also share a useful tip: The tank valve should be atleast somewhere within the same level with the back-plate of the BCD. Hi Thomas, As a fellow instructor who ran a dive club in Egypt for several years…. and from what I’ve witnessed since, globally, by far the biggest problem with buoyancy and in-water attitude is OVERWEIGHTING. It’s fairly common practice to ‘overweight’ o/w students initially, to overcome anxious deep breaths and the new non-gravity environment so that basic skills can be practiced and learned but as the o/w course progresses weight should be removed as students are taught to get ‘a feel’ for their buoyancy. As you say with positioning of tanks, “there is no set rule but experimentation”. I’m often amazed at how many ‘experienced’ divers I come across who dive in an almost vertical attitude mostly due to wearing far too much lead and in many cases they’ve obviously never been taught how to have ‘a feel for buoyancy’. In these cases tank position would not make much difference, if any. Some difference for sure but as I would say it’s a buoyancy fine-tuning technique. I’m currently diving in Cape Town using 6kg but often see folk here diving twice that and more and they wonder where their air goes ! Totally agree, David. The first thing divers need to work on is getting their weighting right, and unfortunately, many divers go through many years of their dive career without doing so. David, that is also a good point. Us, being the teachers in this sport, we should constantly remind our students/guest on proper weighting. For example: Before a dive, we can simply ask them how much weight they use (with reference from their last dive), or perhaps the thickness of their wetsuit. This is the usual case if they favor gear rental. Further, we don’t allow or want our students/guest to be overweight. The usual practice is that we (as the DM or dive leader having a lot more experience) can bring along an extra weight or two that we can easily give to our students/guest just incase they need more. Lastly, during post dive briefing or when you will fill-up the students dive log, we can discuss with them their right amount of weight to be used. This little reminder will can significantly help a diver’s progress. Rolling to the sides with steel tank. Why?